Before coming to Turkey, I made sure I had packed my favorite Mornflake granola cereal that I could eat for weeks or months. I have been eating Mornflake cereal for a while now since I started weightlifting in PH. I used to buy them from the imported section in the supermarket. I like them so much because they are great alternative to ulam and rice because of the protein and fiber content. Anyway, it's already August and my 6 packs of Mornflakes are all gone. 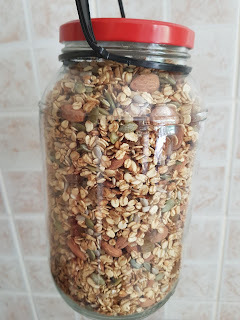 I have searched local groceries here for rolled oats and nutty seeds in the hope of making my own granola cereal, and yes, I was able to come up with a granola cereal of my own that has less sugar and fat, thus more healthy than the store bought ones. Now I don't have to force myself eating Turkish breakfast everyday. Cold cuts, cheeses and olives are not really appealing to me. I also don't like raw veggies in the morning all the time. 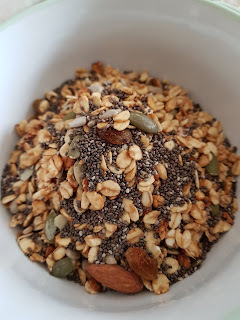 So, to those who are a little health conscious and love some high protein breakfast to maintain some muscles, I say try this recipe. 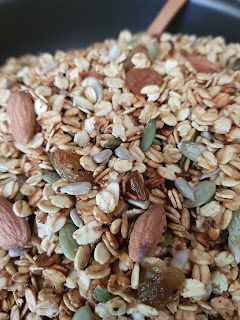 It's time to make your own granola cereal to add to your weekly meal prep! Combine the last 4 ingredients in a pan. Make it boil, stirring constantly. When bubbles, pour the rolled oats all the rest of the ingredients. Keep mixing in lowfire until the oats change into a golden brown color. Let cool then transfer to a tight container. To enjoy as a breakfast treat, transfer a couple of handfuls in a bowl. 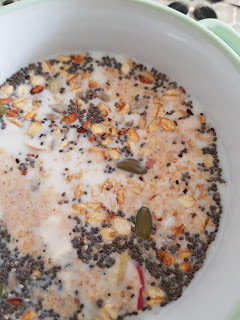 Add some more fresh fruits or protein-rich seeds like chia. Add the type of milk of your choice. Soak in overnight or eat right away. Perfect morning fuel before hitting the gym. Enjoy!